Come Visit Us At Richmond Chrysler Dodge Jeep Ltd. For A Better Look At The 2019 Jeep Grand Cherokee | Richmond Chrysler Dodge Jeep Ltd. When it comes to great all-around vehicles, there aren't much better than a good SUV. These vehicles can take you off-road, around Richmond and get you through adverse weather without much hassle. Among the best of this vehicle type is the 2019 Jeep Grand Cherokee. After getting up close and personal with the Grand Cherokee, you'll discover that there is a lot to like about this vehicle. 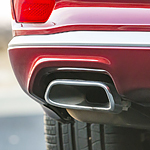 A hidden cold air scoop in the fascia of the Trackhawk version of the Jeep Grand Cherokee helps to generate power. This cooling system keeps charged air under 140 degrees feeding 30,000 liters of air per minute into the supercharged 6.2L engine. This helps the engine run smoothly as it cranks out 707 horsepower. To keep drivers safe while providing a quality braking experience, the 2019 Jeep Grand Cherokee comes equipped with a high-level Brembo braking system. Whether in the SRT or Trackhawk versions of the Grand Cherokee, drivers can be confident that the vehicle will stop in short order after the brakes are applied.